Hello everyone and happy Thursday to you! This week, heck...this month...is just going by too quickly for me! How are you doing on all of your Christmas preparations? I'm pretty far behind right now but hoping for a second wind next week so that I can wrap things up...pun intended! 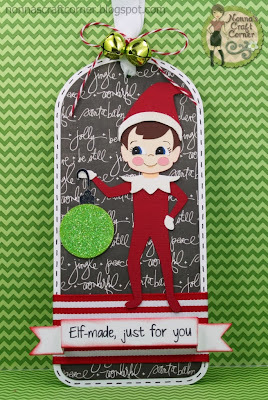 I added lots of bright green glitter to the ornament for some Christmas sparkle. A bit of twine and a couple of jingle bells make for a festive touch. Okay, that's it for me today - back to work! He is too cute!!! Love this Tanya! 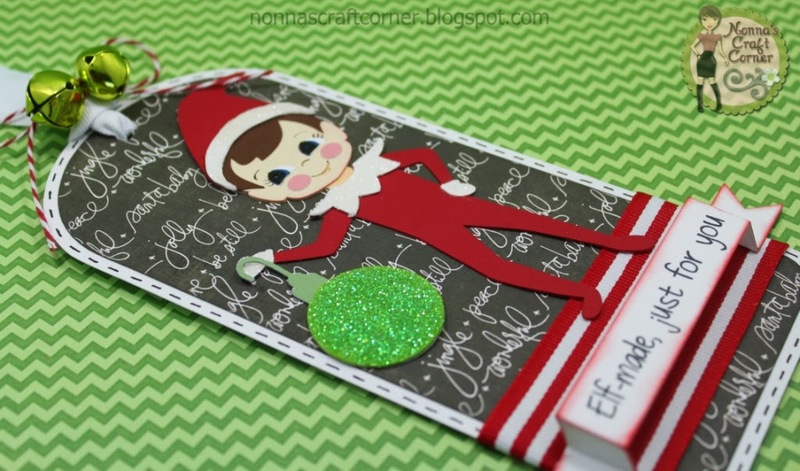 Adorable project, your elf is darling! Oh what a cute tag. I love the elf and the shelf is the perfect touch. LOVE IT! How super adorable is this tag Tanya!!!! Love that sweet elf! Awesome job my friend! Thanks for sharing and have a GREAT night! Oh my gosh, he could not be cuter!! I love him!! The background paper is so fun - it looks like writing on a chalkboard!! The sparkly ornament is a perfect touch!! 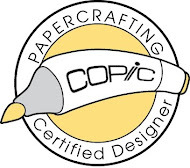 This will look so fabulous on a package - it's a gift by itself!! 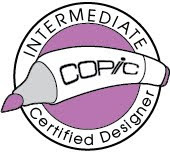 Adorable design Tanya! 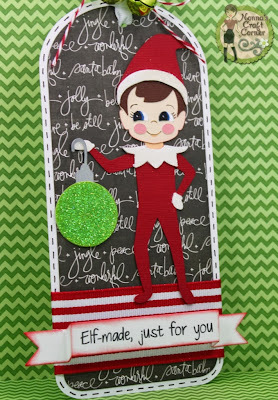 The background is so cute and the elf is so stinken sweet! The little bells are so cute and certainly add the festive look! Don't ya love the banner die from MCS? One of my fav's! Oooh, I am so behind with Christmas preparations! Ugh! After being sick for a wk, it really put me behind and still don't feel like I have all my energy even yet. Oh well, we somehow see to getter done, ha? Super cute. Love that background paper...where is it from. Absolutely adorable!! Love that sweet little elf face!! This tag is so pretty, Tanya. I love the paper and the ribbon. That elf is just too adorable. I love this perfect tag. Sooooo cute! Love that elf! What a cute tag!! I love the DP!! 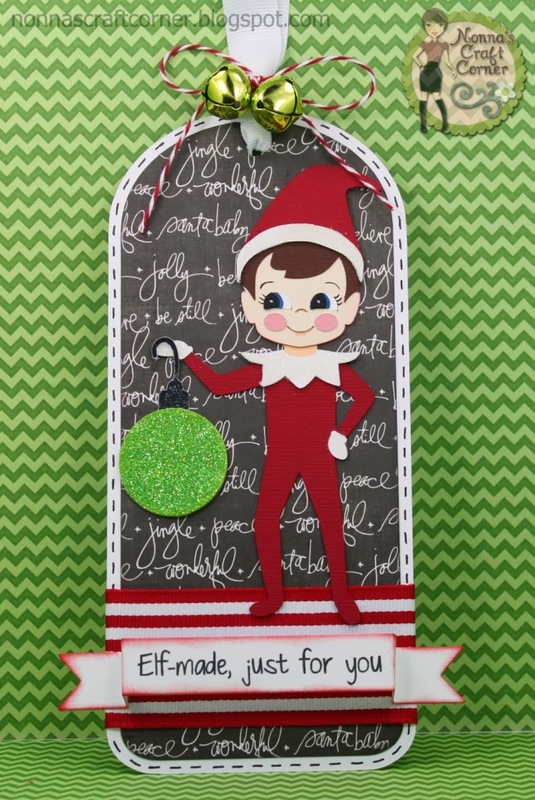 Absolutely Adorable Tag, Love the elf he is perfect. Hope your enjoying your weekend my friend. 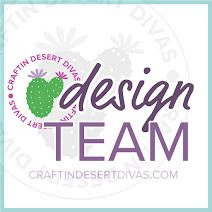 New "My Craft Spot" Store!